After leading some way out that day, Barry Geraghty delayed his challenge on Philip Hobbs’ Defi Du Seuil until they jumped the final fence this time. Defi Du Seuil set sail for home up the hill and was game enough to hold the renewed challenge of Lostintranslation by three-quarters of a length. It was a big-race double for Geraghty and his boss, owner JP McManus, following the victory of Buveur D’Air in the Contenders Hurdle. Hobbs’ assistant Johnson White said: “The 7-2 looks a big price now we’re standing here, but it was a hot, competitive race and Vinndication and Lostintranslation have done nothing wrong. “Barry was delighted with him, particularly with the way he jumped and two and a half miles looks no problem at all. 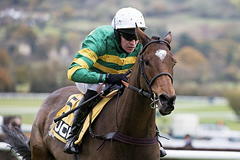 “He saw the trip out well and I guess the race at Cheltenham will depend on the ground. “He was a good horse in his juvenile season and then last season was a write-off, but we knew he was a good horse and he’s come back after last term. “He’s done plenty of schooling at home, but we just thought he might have wanted a bit more – but saying that, he’s got better every time he’s gone racing.